Arrive at Wray Castle in style at their very own boathouse on a lake cruise from Ambleside. 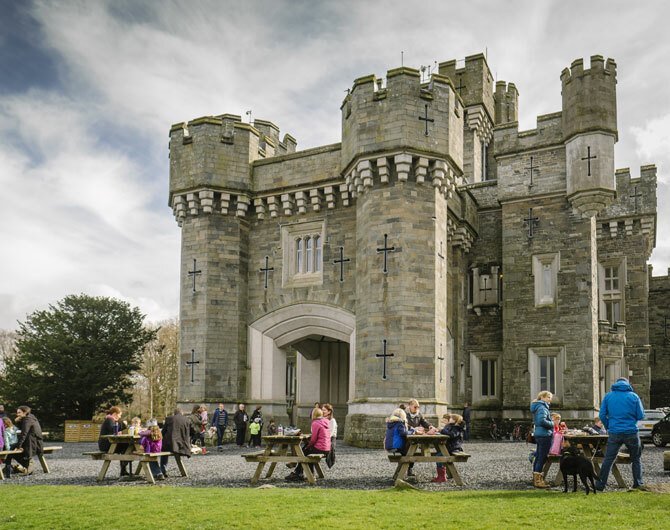 With turrets and towers, a Gothic Revival interior and dramatic views to the fells, there’s lots to explore and enjoy. The National Trust don’t have any of the original castle contents, so it is more informal and child-friendly. The Peter Rabbit Adventure is a great spot for creative play for younger visitors, while older children might like dressing-up, crafts or building their own castle. To find out more about this fascinating building guided tours run for most of the year. There’s loads to do outdoors, with seasonal activities for the family planned throughout the year. Bring a picnic and stay all day! Wray Castle is a great stop on a walk or cycle ride along Windermere’s west shore from Claife Viewing Station. Dogs are welcome in the grounds on leads, assistance dogs only in the castle.